Westerdam Discounts: Cruises from $379 with a Best Price Guarantee. The Westerdam offers full time, year round, kids' programs. 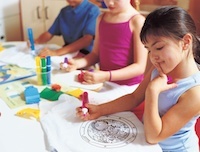 Age-appropriate planned activities for children are provided throughout the cruise. Youth groups onboard the Westerdam are divided based on age. Club HAL takes care of the 5-8 year olds with two rooms full of toys and games provide lots of stimulating choices. Activities include arts and crafts, candy bar bingo and ice cream parties. Located on the Observation Deck (Deck 10). Teenager activities on the Westerdam include trivia contests, card games, theme parties and movies. There is also an "adult free", but supervised area for teens. "The Loft" is a teen hangout with a dance floor, lounge area and a setup for DVDs. Located on the Observation Deck (Deck 10). Age appropriate planned activities are provided throughout the cruise. All the kids get to do ship tours and Coke-tail parties. The Westerdam offers in-room babysitting on a first-come, first-served basis. It is advised that you book your babysitting early on the Westerdam as the staffing for babysitting is often limited. Make your babysitting arrangements through the Front Desk. For a detailed overview of the Club HAL children's program, what to expect, costs, late night babysitting services, slumber parties and child care. Holland America Line even has daycare programs that allow parents to leave their kids on the ship when the Westerdam is in port. Westerdam cruises from $379The latest deals and best discounts on all sailings.